The war memorial was erected in 1922 and dedicated at the same time as the newly hung bells. 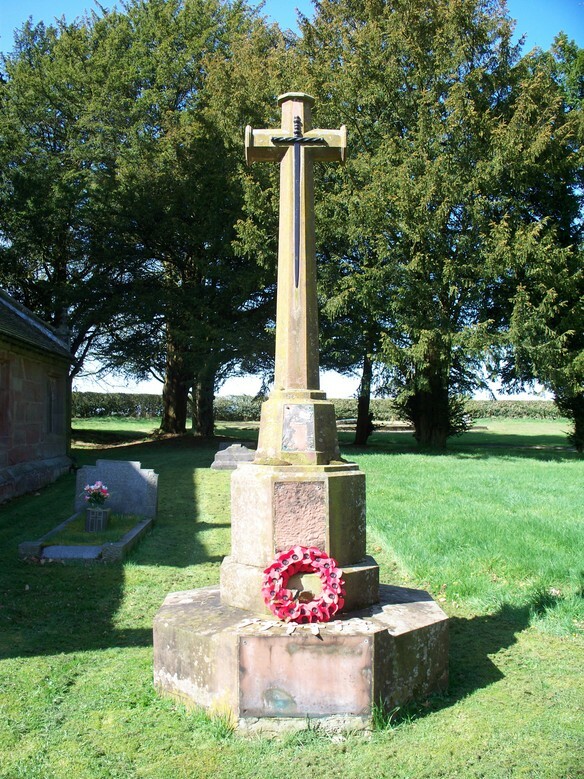 The memorial is of Hollington stone and consists of a series of octagonal bases surmounted by an elegant cross. 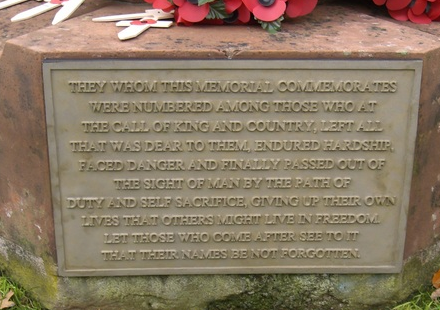 The names of the men of the parish who died in the two World Wars were originally displayed on two bronze tablets, with a third commemoration plaque at the base of the memorial. The memorial stands in a proud and prominent position, giving the local population and the many travellers on the busy B5026 a moment to pause and reflect on the ultimate sacrifice paid by so many and especially those from our small rural community. However, the prominent position has also attracted the attention of a less than desirable element, whose only interest is their own greed, without a care for the distress they cause to others. Some years ago thieves stole the sword from the cross of remembrance. 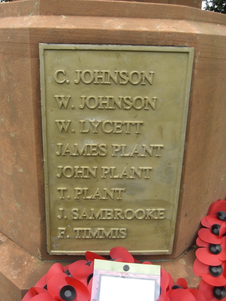 With grateful thanks a replica was made by relatives of John Plant, one of the men remembered on the memorial. This callous act outraged the local community, however in April 2011 the ultimate dishonour occurred, when thieves stole the very name tablets of the fallen and the commemoration plaque from the war memorial. A fundraising event was quickly arranged and through the generosity of those who attended, the money was raised to replace the stolen plaques. 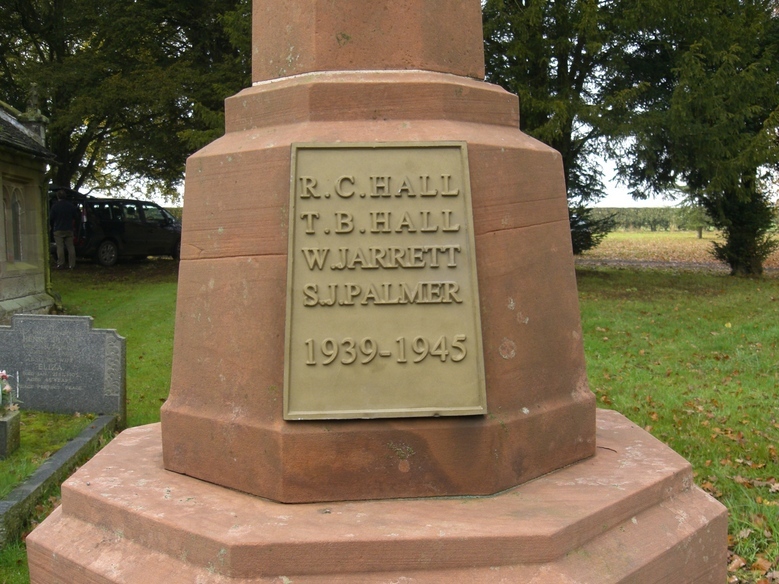 Even though all the metal objects at the Church are now treated with SmartWater, because of the war memorial's prominent position, it was decided to replace them with plaques made from bronze resin - they have the same look and texture as plaques made from cast bronze, but have no monetary value to thieves. Bronze resin is a new process for manufacturing memorial plaques, introduced to this country by JR Designs of Leicester. 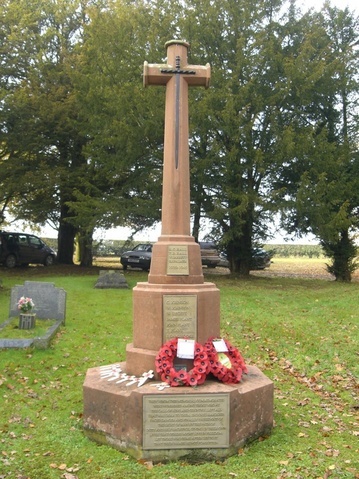 ​The memorial was cleaned professionally by Robert Nicholls and the new plaques were delivered and attached to the in time for the Remembrance Day service on the 13th November 2011. Once again our War Memorial stands proud and is a fitting tribute to the men of the parish who gave their lives ​​in the two world wars.